Epoxy-Plus Fiberglass Covering Kits with our Epoxy-Plus System resin and hardener, are available for many marine plywood boat designs offered on this website. Only the finest materials are included in the covering kits. Every fiberglass covering kit comes with the proper amount of Epoxy-Plus Marine Epoxy and treated fiberglass cloth to completely cover the bottom, sides and transom. This tough, durable covering will greatly strengthen the hull and protect it from the elements almost indefinitely. It reduces maintenance to a minimum, no annual repainting, and provides the sleek look of a fiberglass boat at substantially less cost. 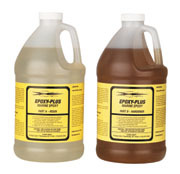 Epoxy-Plus is far superior to polyester resin for applying a fiberglass covering to wooden boats. Why? Because Epoxy-Plus is a powerful and flexible adhesive type coating, polyester resin is not. Fiberglass cloth applied with Epoxy-Plus will last longer and adhere far better, with greater impact resistance, for a long-term, low maintenance surface. When you use our Epoxy-Plus System, you will be working with a premium epoxy system obtained by drawing on our years of experience in the boatbuilding field and the technical experience of one of the top compounders in epoxy coating formulations. The Epoxy-Plus System is part of our complete system of premium marine epoxy resins, glues and surfacing compounds. Unlike the older epoxy systems using a 5 to 1 or 2 to 1 mix, our Epoxy-Plus System incorporates the latest 1 to 1 equal mix system, virtually eliminating errors and the waste found in the older systems. No amine blush, no sanding between coats, low viscosity for easy fiberglass wetout. Cures to a flexible, resilient surface. This equal mix Epoxy-Plus System forms a covering that is both flexible and with unusually high bonding and impact strength. Being practically indestructible makes this the peace of mind protective covering you will want for your boat. The fiberglass cloth supplied in our covering kits is a superior strength fabric woven from pure glass fiber and treated with special finish processes. These finish processes are very important in that they allow the Epoxy-Plus to wet out the cloth properly. When you use our fiberglass cloth for covering, it provides outstanding tensile, structural and impact strength.